One might thus validly use a form of absolution which omitted the invocation of the Blessed Trinity, for example, but one would not do so lawfully. In answer to your query, then – “Is that allowed or does it, objectively, invalidate the Sacrament?” the answer is no, it is not allowed, but no, it does not invalidate the Sacrament either. End. Thank you for your reply. Please be assured that I was not worried in the Confessional. I’m a well informed Catholic, as all Catholics should be, therefore I know what the essential form is to ensure validity of the Sacrament eg. “Ego te absolvo”, or “I absolve you”, in the vernacular. However, you know as well as I do that Sacraments must be valid and licit ie. lawful. The formula you use doesn’t invalidate the Sacrament but it is unlawful. Furthermore, when I go to Confession, or any other Sacrament, I have the right to receive what the Church deems lawful and you have a duty to provide this. I do not wish your individual stamp on the Sacraments and you have no right to do so. Therefore I must ask once again, can you confirm that from now on you will use the correct form of absolution in the Sacrament of Confession? End. The purpose of this thread then it to educate ourselves on the importance of the use of the correct form and matter for the validity of the Sacraments, but also to ask ourselves if technical validity is all that matters. Hopefully, this thread will either encourage Catholics to not hesitate to ask a confessor to use the correct form if they encounter a Fr Curtis think-a-like, or, if necessary, avoid going to Confession in parishes where the priest(s) deviate from the Church’s form. We’ve named Fr Curtis since St Aloysius is a city centre (Glasgow) parish where lots of people go to Confession throughout the week and weekends, but we do not, of course, attribute any malice to him. When Petrus asked him why he added his own words: “… from these [not ‘your’] sins and all the sins of your life”, he replied to the effect that he wanted to send people away feeling reassured that all their sins had been absolved. So, good motivation. He means well. However, it cannot be the case that we leave the confessional absolved from sins we haven’t confessed – we have to identify our sins. What if I’d pinched my granny’s pension book a couple of years ago but had never confessed it? Would that be absolved by Fr Curtis’s assurance that “all the sins of the past life” had been absolved – even if never confessed, never repented? « A New Scots Saint In The Offing? To be honest, I think that people are asking for trouble by going to a Jesuit Priest for Confession anyway, because although the whole Church is tainted with Modernism and erroneous theology, the Jesuits have been influenced more than most. However, the modern rite of absolution is: ‘God the Father of mercies, through the death and resurrection of his Son has reconciled the world to himself and sent the Holy Spirit among us for the forgiveness of sins; through the ministry of the Church may God give you pardon and peace, and I absolve you from your sins in the name of the Father, and of the Son, and of the Holy Spirit’. 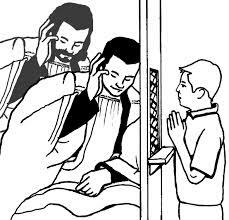 Therefore, could a traditional Catholic, having his or her confession heard in the new rite, request for the Priest to absolve the penitent in the old rite? Many traditional Catholics make their Confession in St Aloysius, Glasgow. It’s a city centre parish and many of us have been going there for years. I used to go to Confession there on a Saturday morning when I was a wee boy. I suppose a penitent could ask for the traditional absolution, but I doubt many priests could give it these days. Although using Latin in the Sacraments does eliminate the opportunity for liturgical abuse, so this is a good example of how dangerous the vernacular can be. I also think the main point, Catholic Convert, is not where we make our Confession, but rather the proper administration of the Sacrament. However, you know as well as I do that Sacraments must be valid and licit ie. lawful. Petrus, please forgive me if I have misunderstood or misremembered your position, but don’t you regularly attend Masses that are valid but illicit? I think the only reasons the SSPX Masses are said to be “illicit” is because of the crisis in the Church. They wouldn’t be illicit in normal times – after all, it’s the same Mass we’ve had for centuries. If any Mass could be deemed illicit, it’s the new Mass, surely? However, I think there is a difference between the Mass of all time NOW being thought to be “illicit” and a priest changing the form of the Sacrament of Penance. I meant to add that the Vatican recognises that the faithful may attend SSPX Masses but would never, I presume, say it was OK to go to Confession where the priest changed the words of absolution. No, where I attend Mass the priests always use the correct matter and form. The priests themselves have no canonical status within the Church, but in these desperate times the Church supplies the jurisdiction. In fact, this thread is a perfect example of why the Society of Saint Pius X is needed, with or without canonical status. When a soul cannot even go to Confession without receiving the proper form of absolution, we know that we are living in extraordinary circumstances. The priests themselves have no canonical status within the Church, but in these desperate times the Church supplies the jurisdiction. On whose authority do you believe that? I would have thought that Ecclesia supplet (if that is what you are referring to) would only kick in if an SSPX priest was ministering to a person in imminent danger of death. Wrong. Ecclesia Supplet does not only “kick in” when someone is in danger of death. On whose authority do I believe this? The Church’s authority, of course. I refer you to Canon Law. By virtue of New Code Canon 144, in positive and probable doubt either of law or of fact on the part of the minister, the Church supplies jurisdiction both for the internal and for the external forum. Given the crisis in the Church “positive and probable” doubt is the very least of what the SSPX priests have therefore we can be certain that “ecclesia supplet”. However, why don’t you comment on the thread article? I can’t believe that in the face of a story about a Glasgow priest ad libbing in the Confessional, you choose to try (unsuccessfully) to pick holes in the SSPX position. It speaks volumes about you. Are not ALL SSPX ordinations illicit, though valid? On that basis, surely there is no doubt that their Sacraments are illicit, though valid. Show me any authoritative Papal statement in support of your belief that SSPX ordinations and Sacraments are illicit. In so serious a matter the Pope would be obliged to issue such a statement. Furthermore, Bishop Fellay has been in the company of Popes and bishops on several occasions, yet the question of illicit ordinations and/or Sacraments has never been raised by any of them. Strange that, don’t you think? Nonetheless, by proxy and by subterfuge, the Vatican authorities have allowed their Bishops to attack the SSPX without check and issue ridiculous statements about schism, validity and legality in their respective jurisdictions. Yes, eileenanne, I echo Athanasius’ request. You were very quick to ask on whose authority I based my comment regarding ecclesia supplet. Please quote one authoritative document that shows the SSPX ordinations and other Sacraments illicit. By the way, given your silence on the matter of priests ad libbing (you’ve been doing these troll like antics for years) we can conclude that you have no problem with Fr Curtis’ disobedience. The case of the Hawaii Six should have brought all such allegations against SSPX sacraments to an end. Click here to read the details. I don’t know what makes you think the Masses of the SSPX may be illicit. This is not the position of the Church as expressed on many occasions by the Pontifical Commission Ecclesia Dei. Nor is it the position expressed by Pope Benedict XVI in Summorum Pontificum. That which has been approved as the liturgy of the Church for almost 2000 years (protected perpetually by the Papal Bull, Quo Primum) cannot suddenly become illicit. A New Mass based on Lutheran doctrine, however, has most certainly and correctly come under scrutiny, as the Ottaviani Intervention and many other theological treatises have admirably demonstrated from the mid to late 1960s down to this present day. Likewise, questions and doubts have been raised by concerned Catholics in relation to the new Sacramental forms of priestly ordination, of Confirmation and of Confession. All of these in our day have been altered from their traditional form, as has everything else in the Church. It is as St. Pius X warned in his Encyclical Pascendi when he cautioned that there is nothing of the Faith that the Modernists do not alter, nothing they leave unsullied of the Church’s perennial teaching. This is certainly true of post-Vatican II conciliarism, which has altered absolutely everything that was once established and clear in Catholic teaching, rendering everything obscure and questionable. No wonder Catholics are confused and get worried when Father decides to do a wee bit of improvising. One does not improvise with the liturgy and Sacraments of the Church, even if validity is retained amidst the confusion of new words. It’s surely the sign that one diabolically disorientated when they describe the verbatim use of the Traditional Sacraments as illicit! That which has been approved as the liturgy of the Church for almost 2000 years (protected perpetually by the Papal Bull, Quo Primum) cannot suddenly become illicit. Nor is it the position expressed by Pope Benedict XVI in Summorum Pontificum. I see no reference to the SSPX in Summorum Pontificum. It is not clear in the post above that the last quote is from Athanasius, not Petrus. Sorry. The PCED, as I stated previously, has made it perfectly clear on several occasions that SSPX Masses are not illicit. It even allows for the faithful to make a modest contribution to collections during those Masses. “Jesus’ mobile number” – LOL! …’Well’…..said the priest…’and did you entertain those thoughts?’…..
….’Oh no, Father’….’but they certainly entertained me!’…..
For reasons of clarity I thought I should say that, assuming sorrow for all sins past and present at the time of confession, it is the teaching of the Church that all sins are forgiven by the words of absolution. The only bar to this is if one conceals a mortal sin during confession, which not only invalidates the Sacrament but also adds the great sin of sacrilege to the sinner’s soul. As to the addition by certain priests of the words “all the sins of your past life,” which I have heard before from other priests, my suspicion is that they believe these to be a reflection of the Church’s teaching on the forgiveness of all sins at the moment of absolution, including forgotten ones of the past, assuming true sorrow and purpose of amendment on the part of the penitent. I don’t approve of priests improvising in this way to make Church doctrine better understood in relation to Confession, even if their extra words do not invalidate the Sacrament. Perhaps they should think about better Catechetical formation of the young so that they don’t feel the need to explain, by illicit word additions, the Church’s teaching on the extend of the forgiveness of sins in Confession! I would just add that should someone forget to confess to stealing their Granny’s pension book (how you could forget that I don’t know! ), the sin is, of course, forgiven, but there is still an obligation to confess this at the next Confession. In addition to what I said above, Father Curtis adding the line “and all the sins of your life” does not accurately reflect the Church’s doctrine due to the fact that a forgotten sin must still be confessed once the penitent has remembers it. You’re absolutely right to say that previously forgotten mortal sins (if it is possible that one can ever forget having committed a mortal sin! ), though forgiven in a general confession, must be confessed if and when remembered by the penitent at the first opportunity. It’s not that the sin has not been forgiven, just that we are obliged in humility to confess it verbally with renewed sorrow for that particular sin. As the saints say, it is the pride of Satan that causes souls to commit mortal sin. All God asks in return, together with true sorrow of course, is that we humble ourselves before the priest, in the person of Our Lord, and confess. A small act of humility in reparation for a great act of pride. God is indeed kind and merciful to sinners! I took it that editor did mean if she’d concealed a mortal sin deliberately (since mortal sins are the only sins we are obliged to confess anyway) but I get the impression that you are saying we don’t actually need to name the sins. I was taught we did need to name each sin, and say how often committed. I said and intended no such thing, as a closer examination of my comments will testify. Nor did I misunderstand what editor wrote. Editor wrote “even if never confessed, never repented?” I merely clarified a question that could have been read as referring to two distinct scenarios. i.e., never confessed (through forgetfulness) or never repented (by concealment). As regards confessing mortal sins: It is absolutely incumbent upon anyone who is knowingly in a state of mortal sin to confess that sin in the confessional with true sorrow and a firm purpose of amendment before receiving Holy Communion, otherwise that person adds the great sin of sacrilege to his unfortunate soul. However, in cases where someone genuinely forgets to confess a mortal sin to the priest in confession, the forgotten sin is forgiven by the general absolution of the priest on the assumption that the person would have certainly confessed it had it been present to the mind at the time. There remains an obligation to confess recalled mortal sins at the next confession, but the Church teaches that one does not have to refrain from receiving Holy Communion in the meantime. The sin is forgiven, but it should be confessed anyway for reasons of true sorrow and humility. Do you now understand what I’m saying here? I get it but don’t try to make excuses for my granny. She knew I could use some financial help, especially at the weekends (I refer you to my pubbing and clubbing schedule, which begins on Friday nights and ends late on Saturdays.) Yip, she knew I could use some help but did she offer? So, what other option did I have? And you want me to confess that little infringement of the moral law as if it were a sin? In Confession? What, they didn’t have soup kitchens and food banks in those days, where she could have gotten help when I “borrowed” her pension book? You shouldn’t have taken all the burden of borrowing your granny’s pension book on yourself. I would gladly have shared that burden 50/50!! Yes, I too am in a daft mood tonight, or rather this morning! Still, it’s light hearted banter. Just a thought, for people who constantly whinge and complain about the ‘modernist church’ whatever that is; why are you going to confession in a place tainted with the diabolical disorientation of modernism.. This implies that the holy and sainted priests(?) of SSXP do not offer the Sacrament of Reconciliation. Or is it that you are realising the error of your ways and are returning to the true fold of Holy Mother Church at long last!! Returning? What a silly thing to say; forgive me, but it’s true. How can you accuse the laity who have stuck to tradition, to have in some way left, in order for them to have to return? Firstly it’s great that this church offers daily confessions. I have availed myself of this more than a few times. And although I don’t remember the priest’s name, I have received the form of absolution that is being discussed here so I assume it was Fr. Curtis. That said, he should be [using] the formula supplied to him. He should not presume to know better than Holy Church. His intent is no doubt benign but on hearing it, I did stop to think “Well I don’t need absolved of all my sins because that’s already been taken care of.” It’s a bit disconcerting. More concerning at the same church is the “sisters and brothers” reversal and even more concerning is the “FOR YOU AND FOR ALL” which lingers on. This is serious. It’s a shame too because the music from the schola at the 12 noon mass is beautiful. Generally speaking, you would hope that the penitent confesses all of his/her outstanding sins. Now given that it may be impossible to remember each and every one, and/or draw a clear line between separate but related or associated sins, after even a short time when clarity has faded, one would hope that the lesser issues honestly forgotten and not confessed won’t cause the penitent extreme grief after death. From the priest’s point of view, shouldn’t he be aware of this and take it into account somehow? The reason “there is no shortage of sinners in the SSPX churches” may well be due to the fact that the conscience of the average Catholic attending these,has been catechised and consequently refined to the extent that the need for confessing sins is fully recognised. Compare this to most Mass goers in the Novus Ordo Masses, which I attend still, to whom the word ‘ sin ‘ is something consigned to the past. The age of arrogance is well and truly here, and no less in Catholic Churches, than it is in every corner of society. Yes there are those who go to confession, but they are very much in the minority. The penitent is not encouraged when sins, though not mortal sins, upon being confessed, are dismissed as trivial, not sins at all, and the penitent feels foolish. There has been an a culture of dismissiveness in the confessional in some places,in the past twenty years, at least in this diocese( St. Andrews and Edinburgh) but it appears to be righting itself now, thank God. I agree. I would be very disturbed if I heard a priest changing the words of absolution and BTW I think Petrus should be warmly congratulated for confronting the priest when it happened to him. That can’t have been easy to do. I’ve got one thing that I don’t like about some confessionals and it’s the feeling that the priest is sitting facing the grille so he can see the penitent. I think we’re entitled to privacy and the priests always used to sit sideways so you didn’t feel they were looking at you. I have been to St Aloysius and that was one church where I got the feeling the priest was looking at me. I really don’t like that. Thank you for your kind words, but in actual fact I left the Confessional and went on my merry way. The words of absolution used stuck in my mind and I mentioned it to a friend via text message and she confirmed what I was thinking – the priest shouldn’t change the words. However, when you are caught off guard it’s hard to think on your feet. So, I went back to the Church and back into the Confessional. Believe you me my heart was pounding in my chest. I should say that Fr Curtis was very pleasant and at no point did he object to what I was saying. I can’t think of anyone who would like what you describe re the “see through” grille – and you’re not the first to notice/mention it – but there’s not much anyone can do about it. Except offer it up as part of the penance! I’m mindful of small mercies! I’ve never had a priest change the words of absolution in Confession. Until I read this thread, I didn’t know the penitent could request the confessor to repeat the words of absolution using the correct form. I wonder if there have been priests who have refused to comply with the request? What then? I presume we would have to go to confession to another priest, though, if we knew the priest had changed the words of absolution, just in case the sacrament was invalidated. I know it turned out that Fr Curtis’s alteration didn’t invalidate the sacrament but most of us wouldn’t be sure of that. I don’t think anyone would need to go to confession again. If the priest does something wrong with the form it’s not the penitent’s fault. I would just make a good act of contrition and presume that God has absolved me. Why should I have to bear responsibility for the priest’s arrogance in changing the form? You have a point there! Provided the priest uses the words of absolution (even if he does add something else at the end), we should confidently trust that we are absolved and leave all in God’s hands. We always have to be careful of scruples. The devil uses all kinds of tricks, especially after confession, to suggest to us that perhaps we are not absolved after all. Such suggestions have to be vigorously resisted, unless of course we know for certain that the priest did not use the words of absolution or that we concealed a mortal sin, which, please God, none of us will ever do. That is exactly right. If there was no valid absolution then we must either ask the priest to give proper absolution or go to another priest. I was making the point that I shouldn’t have to go to another priest, even if I do see that the priest has changed the words. If I ask him to say the correct words and he refuses, why should I have to go to another parish? I’m sure that God would not keep absolution from me if it’s the priest’s fault, not mine. I don’t think I have ever heard of a situation where a priest has not provided a valid absolution in confession. Additional words, such as those used by Fr. Curtis, while not correct, nevertheless do not invalidate the absolution. What is important is that he pronounced the words “I absolve you in the name of the Father and of the Son and of the Holy Spirit.” Regardless of all else, this validates the absolution. In the event that a priest did not use the words of absolution at all, saying something else like ‘I forgive you, now away and buy yourself an ice cream.’ Well, that would definitely require the penitent to request of the priest the proper form of absolution, or else go to another priest. In cases of mortal sin it is absolutely essential to hear the priest pronounce the words of absolution (as per above). If for some bizarre reason he does not absolve in the name of the Blessed Trinity, then the penitent would certainly be obliged to ask him to repeat the absolution using the correct form or else go to another priest and confess again since the sin cannot be formally expunged if the proper form of the Sacrament has not been used. I don’t see this as a problem for souls who are genuinely sorry for their sins and want to be assured of Sacramental absolution. It’s a perfectly wholesome Catholic desire. I didn’t say anything at the time but I knew this was wrong. I contacted the Chancellor at the time, Mgr Peter Smith, and he said I should go to Confession again. It would have been helpful if the Mgr. explained why he thought you should re-confess. Perhaps he considered the words “I forgive,” rather than the ‘I absolve’ to have invalidated the Sacrament. I have to say though, this kind of thing is very rare. Yes, he said by omitting “absolve” it invalidated the absolution. I have it verbatim from an SSPX priest that the words of absolution must be correct ie I absolve etc etc, or the confession is not valid and void. If I were the lay person I would go to confession again. In fact if I were that lay person and had been going to a modernist Chapel for a good while, I would seek a Traditional Priest and do a general confession. I think I would like to hear my absolution underpinned by the Holy Trinity, preferably in Latin. Yes, course. However, we needn’t worry about validity as long as we hear the crucial words. I think we need to be on our guard on two fronts here. Be aware that the priest must give valid absolution, but be aware of scruples too which can rob us of the peace we receive after being to Confession. The devil is very clever and immediately tries to sow doubt in our mind. While I can understand where you’re coming from, I do think we have to be very careful as Traditional Catholics not to give the impression that we doubt the validity of all confessions heard by modern parish priests. That would be a very grave error that the SSPX would certainly not subscribe to. As Petrus and others, myself included, have pointed out: provided the correct form of words are used, i.e., “I absolve you in the name of the Father and of the Son and of the Holy Spirit…” the absolution is valid. If souls prefer to confess always to a Traditional priest, then that’s fine. But it should be on the basis that Traditional priests are likely to offer more orthodox instruction, if such is required, and enjoin a more suitable penance, though many parish priests are equally orthodox in this regard. I think the main observation to have come from this thread is that while Traditional priests always use the proper form of absolution, etc., there are a handful of maverick priests in parishes whose forbidden innovations with this Sacrament have generated a fear among informed souls that no modern parish priest can be trusted. This does a great injustice to many parish priests who would never dream of tampering with the words of absolution and whose instruction and penances are perfectly sound. I take your point. My emphasis, though perhaps not clear, was concerning a lay person who had been in the position of someone who had been given dubious absolution, through ad hoc verbiage, like the case in relation of Fr. Curtis. Mortal sin doesn’t take prisoners remember. There is no room for doubt. Yes, I thought that was your point. I just thought I would stick my neb in with a clarification in case someone got the wrong end of the stick. I wonder if I’m suffering from a touch of clarification OCD? I must seek to clarify that suspicion! Now, from the quote from the theologian, the bit where he says the words ” ‘I absolve you’ or equivalent” are necessary for validity, puzzles me slightly since, I cannot find a single synonym that could be considered the “equivalent” word for absolve, as it applies in the Sacrament of Penance. There is a huge difference between being forgiven and being absolved. If someone offends me in some way and asks for my forgiveness, I can forgive them. But I cannot absolve them. If any priest said to me in Confession: “and I forgive you…” I would immediately point out that I wasn’t seeking forgiveness but absolution. If forgiveness is all that matters, we could go round the people we’ve offended and apologise, and we could do what the Protestants do when they offend God, tell Him they’re sorry in the privacy of their own rooms. It’s absolution that is the pearl of great price in the Confessional. That quote from the Traditional priest is absolutely correct, as are you when you say that “forgive” is not the same as “absolve”. Petrus has confirmed, as I suspected, that it was the use of the former rather than the latter phrase that resulted in Mgr. Smith declaring a particular confession to be invalid. There now, you can put your Easter eggs away until Easter. In fact, give them to me for safe keeping!! Nobody, but nobody gets to keep my Easter eggs! In fact, I’m so pleased to discover that we agree with Mgr Peter Smith on SOMETHING, that I may just send HIM my Easter eggs to say… WOW! I am quite worried by this thread, and am sure that somewhere along the line I have missed or misunderstood the point. I fully understand the Church’s teaching on the Sacrament of Penance, but have received the impression from some of the above comments that there is a suggestion here that the penitent’s sincere sorrow for his sins and firm purpose of amendment would not obtain the forgiveness of God for his confessed sins if the priest did not pronounce the words of absolution correctly. Jesus Christ speaks in confession through His minister, and if that minister, by ignorance, carelessness or malice gets it wrong, I am sure that Christ does not, and there are assurances in His public ministry that sins have been forgiven when a sinner has repented. Christ, in instituting the Sacrament of Penance obliges all to confess sins, but my point is that before God the penitent’s repentance must, in justice, suffice, as it does if he is unable to get to Confession, for example at the moment of death. Sorry to come late to the thread after having logging-on problems and throwing a spanner into the Easter eggs.. I take a different view on this. I believe that Catholics have an obligation to catechise themselves and so be ready to correct errors when they occur. Ignorance is no defense on the part of the laity. That does not mean that we start undermining our Priests, but what it does mean is that we demand excellence from them to the point of correcting them when necessary. If you can’t change the words of the Pater Noster, then nor should the words of absolution be changed. The devil lurks in the vernacular. I think you have, in fact, misunderstood the point. Nobody has said that “the penitent’s sincere sorrow for his sins and firm purpose of amendment would not obtain the forgiveness of God for his confessed sins if the priest did not pronounce the words of absolution correctly” but it is a mistake to downplay the gravity of a priest mucking about with the form of any sacrament, least of all the Sacrament of Penance. You say that you “fully understand the Church’s teaching on the Sacrament of Penance” in which case you will not need reminding from me that the validity of the Sacrament (any sacrament) requires that the proper Church approved form and matter are employed. And if words mean anything, then if the Church approved form and matter are NOT employed, the sacrament cannot be valid. That is, it didn’t “work” because the priest did not employ the proper form and matter. If a priest says “this is my body/blood” over a bottle of wine and a slice of garlic bread, there is no transubstantiation and we are left with a bottle of wine and a slice of garlic bread. Christ does NOT come into the soul of the recipient, body, blood, soul and divinity, as He does when the proper matter is used in the Mass, even though the correct form of words may be used. That’s not evidence that God lacks mercy and does not care, it means that He had good reason for establishing the Sacraments and He wishes to work through them. Similarly, if the priest chooses to change the words of consecration over valid matter, we are left with a piece of unleavened bread and a chalice of wine. If the Communicants are in ignorance of all of this and believe they have done their duty to approach for Holy Communion, God, in His justice, will not allow them to suffer for the sins of the priest. If they are aware of the necessity of the form and matter, however, and just don’t care, who knows what will be in the mind of God? We’re really now in the area of “risk assessment”. Would you want to risk offending God by adoring a piece of bread and wine when you know it’s probably nothing more than that? It’s not always a case of blaming the priest and then depending on God’s justice and mercy. It is sometimes a case of blaming the priest AND the apathetic lay person. Ultimately – and this is the reason none of us can ever judge the soul of another – only God knows what is in the heart and soul, and is in a position to judge definitively. But that is a different issue from the importance of the correct and faithful dispensing of the Sacraments by priests. To create a false dichotomy out of the two is a big mistake. We must never minimise the seriousness of what priests are risking who change the form and matter of any Sacrament, because Christ has elected to dispense His grace through the Sacraments and we can be certain that He does so only if the priest honours the Church approved form and matter. Those who wish to risk that Christ routinely by-passes His priests do so at their own peril. Rest assured that few if any of us on this thread are conscious of any regular failure on the part of priests, even the innovating ones, to properly absolve sins. A priest would have to go to extraordinary lengths to negate the Sacrament of penance. I suppose there have been occasions, but these should be considered few and far between. Of course the use of the vernacular has allowed some priests to play around with the form of absolution, usually not to an invalidating degree but enough to cause the more informed Catholic to be troubled in conscience. The devil doesn’t miss such opportunities as the innovating priest provides him! How right Summa is to say that the devil is in the vernacular. That observation applies to all aspects of post-Vatican II liturgical and Sacramental reform. Still, you are absolutely correct to state that if a person has true contrition for their sins and goes to Confession with an upright intention then those sins are absolved by God, who reads the heart. However, I again agree with Summa to an extent, by which I mean that lay Catholics are obliged to know at least enough about the Sacrament of Confession to be able to tell when a priest is clearly not administering absolution in accordance with the Church’s formula, i.e., “I absolve you in the name of the Father and of the Son and of the Holy Spirit”. Every Catholic should know that if these basic words are not spoken by the priest then the Sacrament is invalid. If they don’t know this, then I’m afraid there is something very lacking, I would suggest culpably so, in their education. The bottom line is this: Even if a person has been forgiven by God by reason of their sorrow, it is still incumbent upon them to receive Sacramental absolution from a priest at the earliest opportunity, unless this is impossible for extreme reasons. Not only are they obliged to make use of the Sacrament, they are also obliged to recognise and question suspicious departures on the part of priests who may use forms other than the form always used by the Church, and to seek absolution elsewhere from a sound priest in the event that the one they have just confessed to fails to provide valid absolution. While I understand that people can be led into error by ignorance in many things pertaining to the Faith, surely it is not too much to expect every genuine Catholic to at least know that a priest has not absolved validly in confession who has failed to absolve in the name of the Father, the Son and the Holy Spirit. I mean, even young children should understand this fundamental truth. Hence, there is no excuse for lay ignorance in the matter. Anyway, as I say, the debate is pretty academic since valid absolution is still fairly certain in most parishes. Very few priests tamper with the Sacrament in a way that invalidates it. So, as long as the priest says “I absolve you” that makes a valid Confession, according to him. I do hope you are right about most parishes the priest not tampering with the Sacrament. It’s terrible that Catholics have to listen hard to be sure of that. I didn’t mean to sound as if I was correcting you – i am actually surprised that the priest could say I absolve you without saying “in the name of…” so I was really pointing it out because it is surprising. When I said it myself it didn’t sound right at all and I don’t suppose any priest would actually omit the Blessed Trinity but there again in these days of blessings from the Creator, Shining Light and Mother Earth, you never know! No, you made a valid and courteous point of correction and I am grateful for it. We all have to be clear on these very important issues. Like you, I was somewhat surprised to learn that the invocation of the Holy Trinity can be omitted without invalidating the Sacrament. But maybe we are confusing the significance of the invocation with Baptism, where it is absolutely essential for validity. The good news is that I have never heard of a priest omitting the invocation from the words of absolution. I’m sure the odd one has done so, but it’s extremely rare. For a sacrament is the sign of a sacred thing; but the sinner unequivocally signifies, by signs of words and actions, that he has withdrawn his mind from the defilement of sin; whilst in the words and actions of the priest we easily recognise the mercy of God remitting the sins themselves…..for the absolution, pronounced in the words of the priest, declares by sign that remission of sins which it accomplishes in the soul. For, as the Council of Trent also teaches in Ch.V, X, Christ instituted the Sacrament of Penance in order that we might have less room to doubt of the pardon of sins promised by God and to calm our solicitude. Further, it teaches, for the mind should be in the greatest suspense as to the sincerity of inward penance, since, in what he does, every man has reason to fear his own judgement. This is to say that although the sinner judges that he has repented of his sins, and consequently has had them forgiven by God, nevertheless he should seek that reassurance that this is so by hearing the priest pronounce the words of absolution. For the voice of the priest, legitimately pardoning our sins, is to be heard as that of Christ the Lord, who said to the paralytic: “Son, be of good heart; thy sins are forgiven thee”. Moreover, as no one can attain salvation but through Christ and the benefit of His passion, it was meet and of very great advantage to us that a sacrament should be instituted by the force and efficacy of which, the blood of christ flowing to us might wash away the sins committed after Baptism, and that we might thus acknowledge that to our saviour alone we are indebted for the blessing of reconciliation. The whole of Ch.V on the Sacrament of Penance repays study, as it deals comprehensively with the nature of penance and differences between various meanings of the word. Anyway, to sum up, I thought that there was some ambiguity in the thread, and while eggs and grandmothers might spring to mind, I thought it worth while trying to explain my unease. Thanks for that great post, you have amplified what editor said about the two distinct issues, God’s forgiveness for the repentant sinner and the playing around with the words of absolution. I’ve now got it clearer in my head! Thank you Christina for that interesting post, and to all others who have contributed so. You are quite possibly on to something when you say I may have misunderstood you. I am not nearly as well catechised as I should be and along with being a bit of a dullard, or should that be a dumb ox, it leaves serious gaps in my erudition. When Father Curtis used the words I absolve you from your sins he was acting as a true priest representing Jesus Christ since he knows that he a mere human cannot absolve. I have not difficulty whatsoever with his words since I do not see god sitting with a rule book to see that everything is in order before he acts. God is compassion. Petrus on the other hand did not act as a true penitent since he was more set on finding fault with the priest than accepting forgiveness. On the grounds of your frivolous observation, I guess we can just go ahead and chuck the Ten Commandments out the window, being, as they are, a set of rules that God is not that concerned about. And while we’re at it, let’s get rid of all dogmas, rituals and Sacramental rites and written disciplines of the Church, all just so many rules and regulations that the Protestants were quite right to eject 450 years ago. Hmmm! I think you should re-think your position. By the way, Petrus was not set on finding fault with the priest and was very keen to receive forgiveness. Unfortunately, and this happens when one knows the Church’s teaching, Petrus heard the priest say things that are not in the rite of absolution. He was rightly concerned about this and raised questions, as any serious Catholic would be who wanted a valid absolution.